On Thursday March 4th, UB’s Office of Off-Campus Student Services hosted its annual “Moving Off-Campus Fair”, which welcomes both on-and off-campus service providers to conduct demonstrations and provide information for UB students who are moving into off-campus neighborhoods. Organizations participating in this event included the City of Buffalo Housing Inspectors and Office of Citizen Services, UB’s offices of Environmental Health & Safety, University Police, the Student Wellness Team, and Legal Services. Students were enlightened on issues regarding tenants’ rights, selecting roommates and landlords, transportation, utilities, recycling and garbage pickup, preventing burglaries, and acting as responsible members of their community. 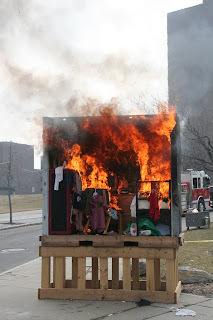 UB’s office of Environmental Health & Safety also provided fire extinguisher training and simulated a bedroom burn outside of the Student Union to portray the quickness in which a room can be engulfed in flames. For more information regarding UB’s Off-Campus Student Services or to be involved in next year’s Moving Off-Camus Fair, call 829-3541 or visit http://livingoffcampus.buffalo.edu/.